In lieu of my Makeup of the Week I decided to update you all on my Current Makeup Favorites. I hope you find this helpful and informative. **click on each item for a direct link to the product. Dr. Mercola Facial Sunscreen SPF 30: The absolute best natural sunscreen. I do not wear commercial sunscreen because I cannot tolerate the odor and the plethora of chemicals in the formula. However, Dr. Mercola’s all natural line of sun protection products cannot be beat. This is especially ideal for those with sensitive skin. Hourglass Mineral Veil Primer: I really appreciate this primer in the summer. It evens out your skintone and really does prolong the wear of your foundation. Estee Lauder Double Wear Foundation: Foundations come and go but EL Double Wear is my HG foundation. This guy never lets me down, the longevity and finish cannot compare. Apply EL Double Wear on well moisturized skin, with a damp brush/sponge and blend to perfection. I love all of their foundations. Edward Bess Concealer: As of late, I had to revert back to wearing concealer and EB is one of my favorites. I had the pleasure of meeting Edward at Bergdorf and he was just as lovely as he appears on TV; a true Southern Gentleman! Laura Mercier Eye Canvas: Great base for eyeshadows (reviewed here). MAC Mineralized Skinfinish Natural in Medium Plus: I use this as an all over eyeshadow to even out my skin tone on my lids. On occasion, I do use this on my face to set my face makeup. MAC Powerchrome Eye Pencils: Copper Strip (reviewed here) and Life’s Luxury (reviewed here). Prestige Total Intensity Eyeshadow in Wicked: (reviewed here). Clinique True Black cream eyeliner: Wonderfully black, smooth, long lasting and relatively inexpensive for a high end brand. Inglot #89 Matte AMC Eyeliner Gel: The only color/formula that will last on my upper waterline for tight lining purposes. L’Oreal Telescpic Mascara and Prestige My Blackest Lash Mascara: The L’Oreal is for lengthening and Prestige is for giving volume. Both can be found in any drugstore. Shu Uemura Eyebrow pencil in Seal Brown 02: A naturally flattering color for my dark brows. Laura Mercier Ritual Bronzer Blush: One of the best bronzer to have come out this year. It was limited edition and is sold out online. Check your local Sephora locations and LM counters for availability (reviewed here). Laura Mercier Highlight 01: Beautiful neutral colored highlighter that can be used wet or dry (reviewed here). Bobbi Brown Pale Pink blush: This color is universally flattering on everyone. It is matte and extremely long lasting. BB has one of the best blush formulas around. MAC Sweet As Cocoa: Rosey Bronze blush can also be used to deepen a matte bronzer, as an eyeshadow, and a blend out color (reviewed here). Skindinavia Finishing Spray: Admittedly, I do not use many finishing powders in the summer time. I do use this spray to prolong the wear of my bronzer and blush and to help meld all the colors together on my face. Daliia Lip Stain in Runway Fashion Fuchsia: Love the naturalness, longevity, color, and wear of this lip stain. I may have to pick up another one (reviewed here). 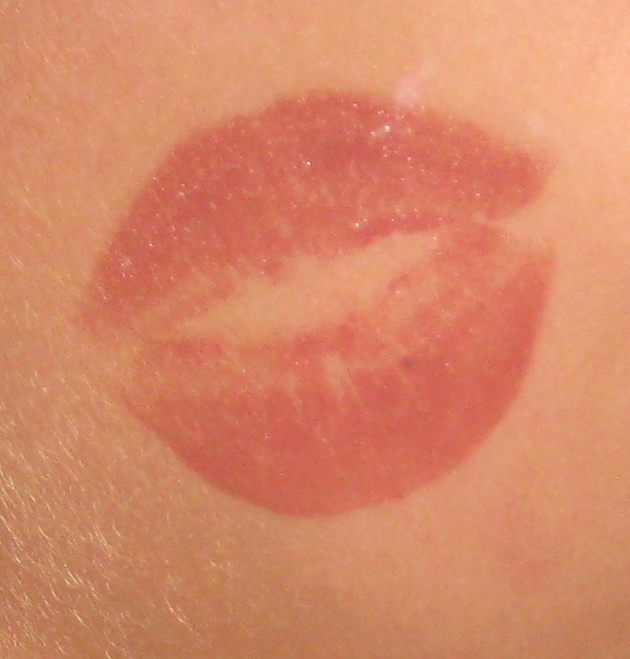 My Best Friend’s Red lip stain is next on the list. Dior Addict Lipstick: These are wonderfully creamy and smooth. They will not dry out your lips and last nicely paired with a long lasting lipliner (reviewed here). Shiseido Rouge Lacquer Liquid Lipsticks: The best liquid lipstick I have found, they do not contain any fragance or flavoring, long lasting, wears off evenly and pairs beautifully with Daliia’s lips stain; will not cause it to break down or bleed into your fine lines. 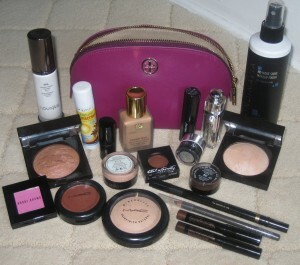 Tory Burch Makeup Bag: A wonderful addition to my makeup family. This bag is roomy enough to fit all of your essentials and more. Makeup would tell you to invest in products you know you will use and love. Do not be a moth to the makeup flame, stick to what works. Now, if only I would take my own advise 🙂 To be continued….with current brush favorites. Be well and stay safe. **Ifmakeupcouldtalk.com is not affiliated with any of the brands mentioned and all products were purchased by me. **Compensation for reviews is not given.